Boil water in a pan, add potatoes and par boil in high for 5 mins. After 5 mins, drain water and keep it aside. Make spinach puree with little water in a blender. 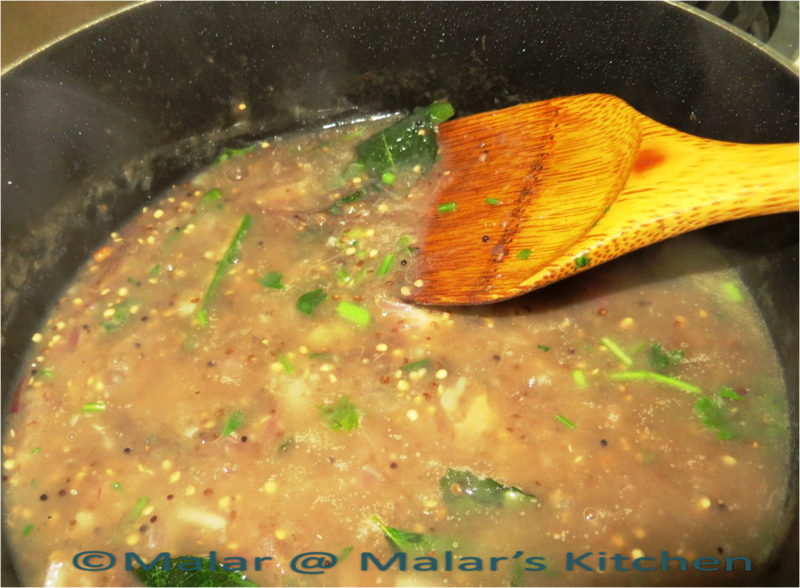 Heat oil in a pan, add mustard seeds, urad dal, cumin seeds, asafoetida. When they crackle, add onions, green chili, ginger garlic paste, turmeric powder. Next add the par boiled potatoes and mix well. 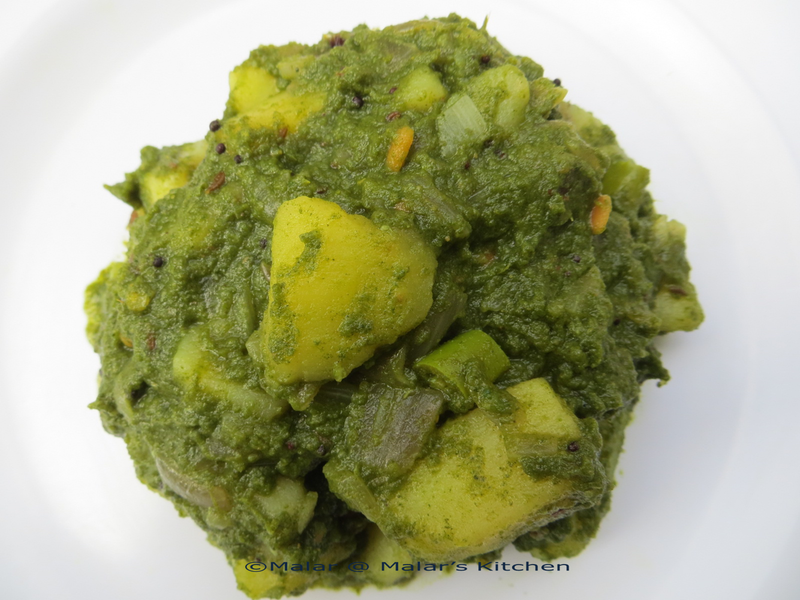 When it is 75% done in cooking potato, add the spinach puree, salt, garam masala and mix well. This is a very special dish at my home. My grandma prepares it for any pooja that we do at home, even during Pongal. When some one leaves to a pilgrim trip from home( for those who know patha yathrai to Palani) this is a must in my home. And we all love it when my grandma prepares it 🙂 This is a simple kuzhambu, but need a little extra oil and we use only gingely oil for this. Gingely oil is very good for health and has a cooling effect to the body. It gives a great taste to the dish. Peal the skin of plantain and cut them in to pieces. Cut the Eggplants as well. If the red pearl onions are very small, you can use them directly. If big then we can chop them to 2 pieces. In the tamarind juice mix the kuzhambu milagai thool or (red chili powder and coriander powder), turmeric powder, salt and mix well. Check for the taste and adjust. Next in a large pan heat oil. 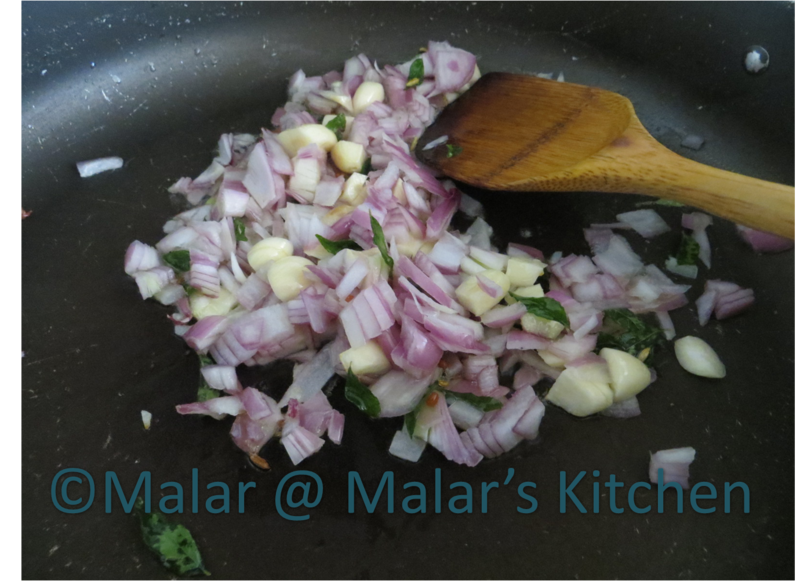 Add the items in to temper, when they change color add the onions and saute for 2 mins. Now add the Eggplant and plantain and saute for 5 mins. 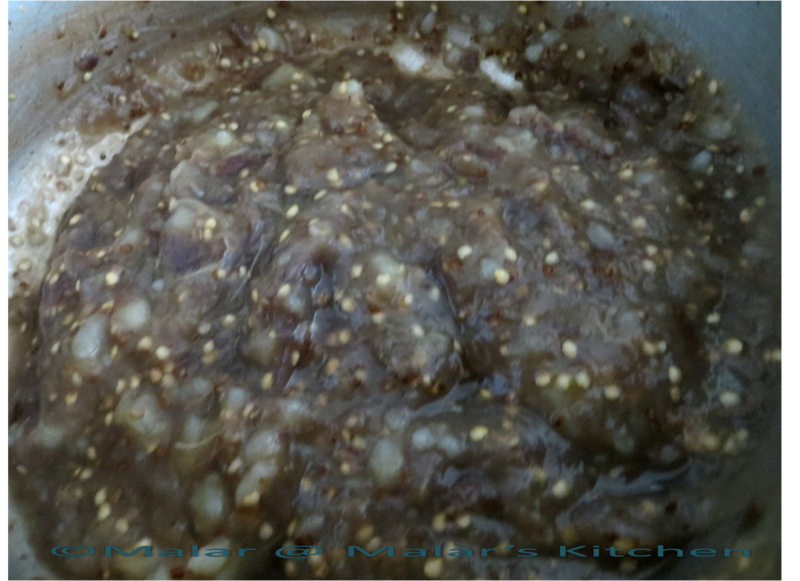 Add the tamaring juice where spice powders are added and let the gravy get heated. Close lid. This will take around half an hour, when the oil would start floating in the top layer. Now stop and garnish with cilantro leaves. 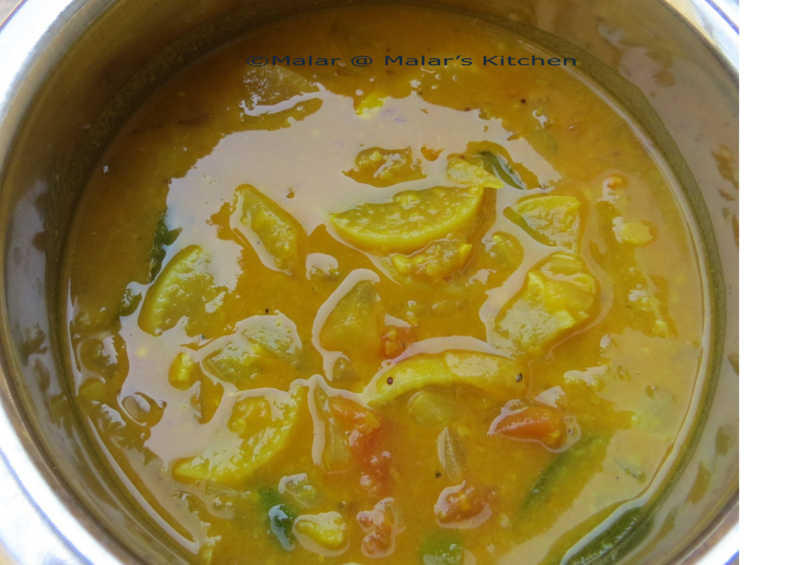 In a pressure cooker, boil the lentil/toor dal with turmeric powder in 2 cups water and cook it for 6 whistles. In a large pan add radish, onion, tomato, green chili, garlic, ginger with 3 cups of water and boil. Add turmeric powder to this. Boil for 10 mins. 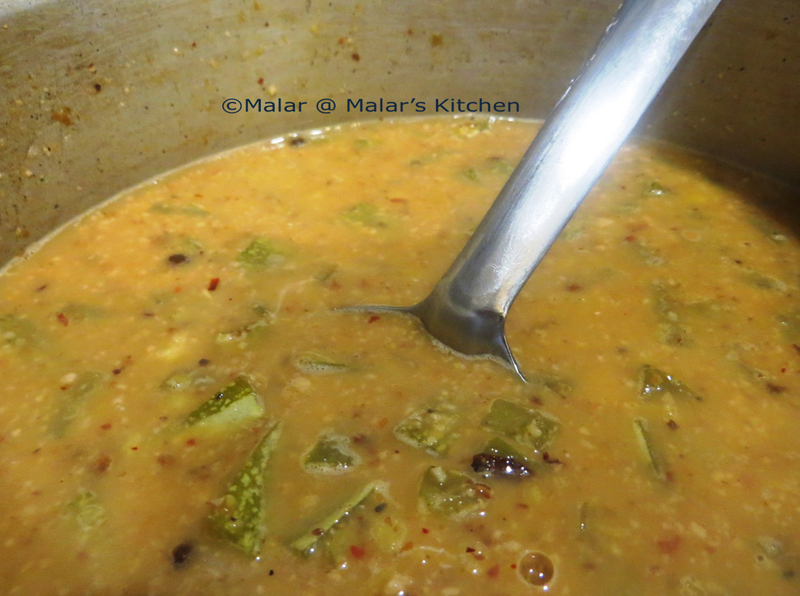 Then add sambar powder and cooked dal to this and cook for 15 mins. Next add the tamarind pulp and salt to this and heat for 5 more minutes. In a separate pan, heat oil and add items in to temper. 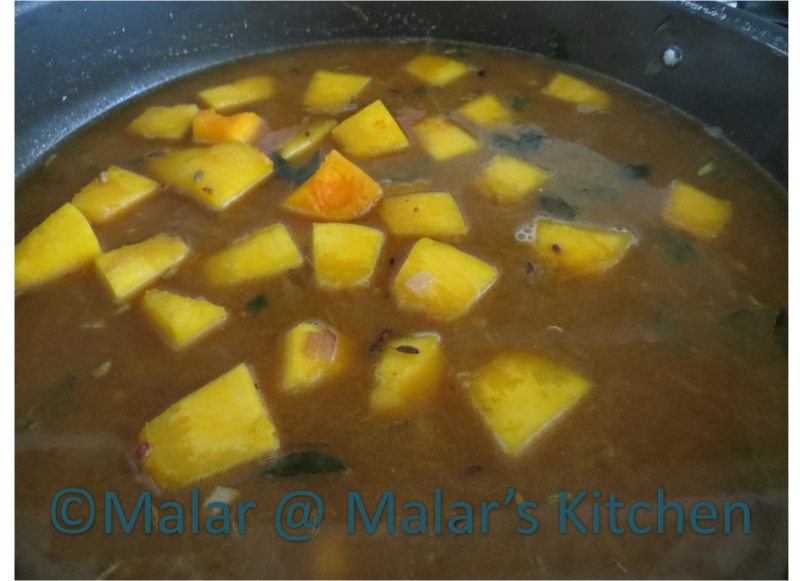 Add this to the sambar and stop from cooking. Add the cilantro leaves and garnish. High in water content, low in fat. It contains a lot of fiber. Snake Gourd juice is used to reduce heart pain and heart disorders. It is a good source of minerals and vitamins. Heat oil 1 teaspoon in a pan. Add the items in to grind except coconut and when they change color, stop cooking and add coconut now. Cool down for few mins. 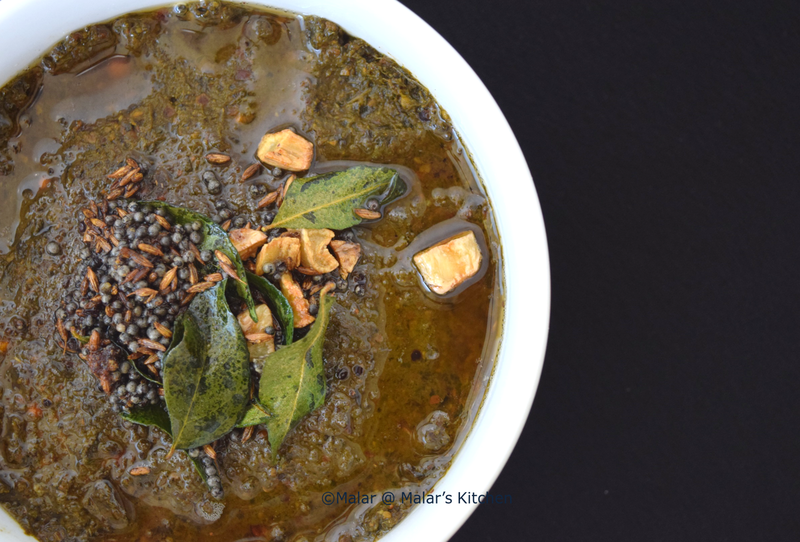 Next in a pressure cooker, add moong dal, toor dal and the chopped snake gourd. Add water just to cover it and cook for 3 whistles. Now grind the above which has cooled down. 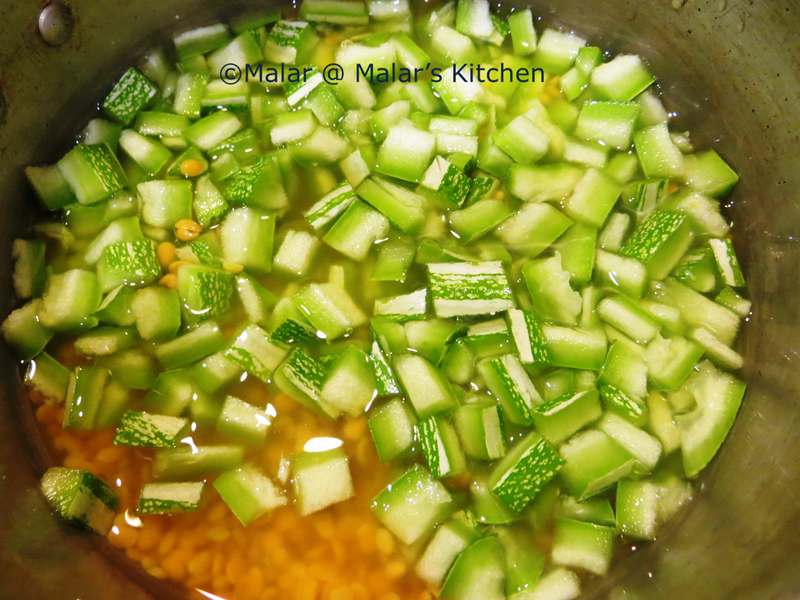 Add the paste to the cooked snake gourd and lentils along with salt and boil for some time. Next heat 1 teaspoon oil in a pan and add items in to temper. 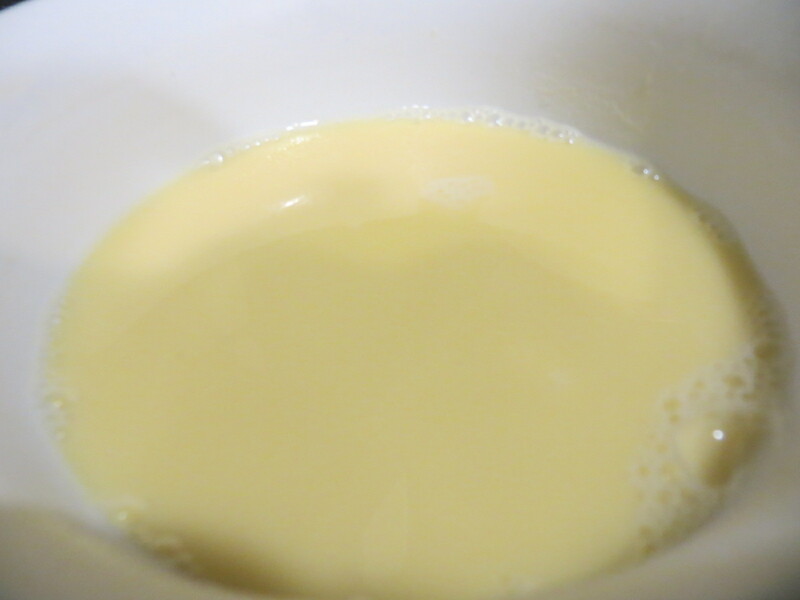 Once it is ready mix it in the boiling curry. Stop and garnish with cilantro leaves. 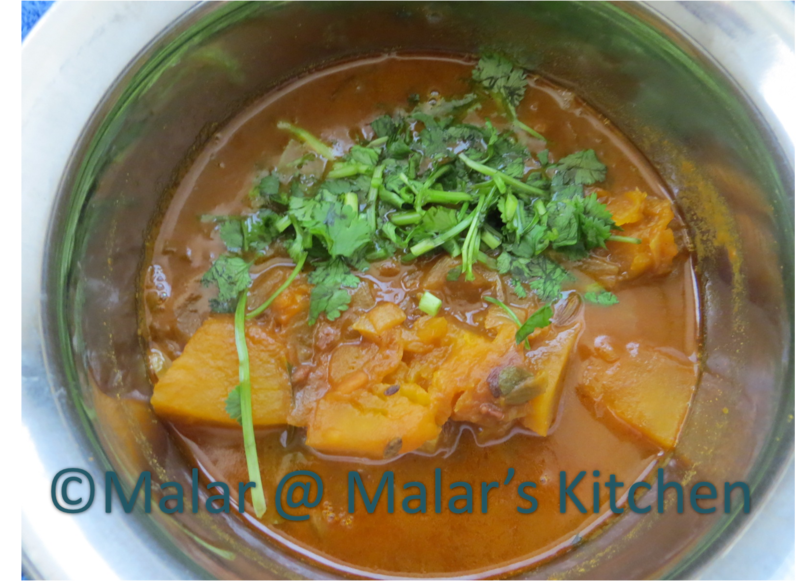 Serve with hot rice/ Roti. 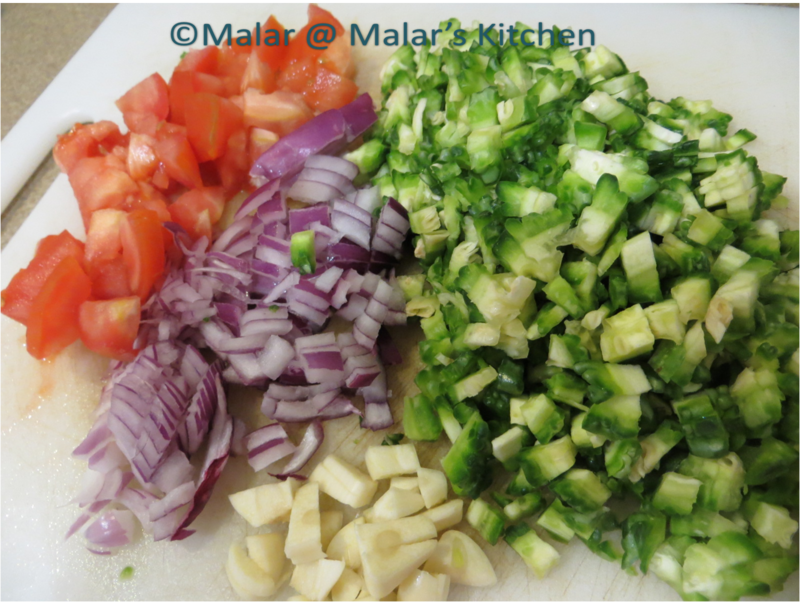 This method can be used with any veggies or mixed vegetables as well. This is my second recipe with Bitter melon. These are low calorie vegetable. Its an excellent source of iron and vitamins, minerals. Its a great medicine for those with diabetes, kidney stone, psoriasis, piles(haemorrhoids). They help in increasing the longevity. Heat oil in a pan. Chop all the vegetables. When oil is hot add items in to temper. Next add Onions and garlic. When the tomato is cooked well add chili powder, turmeric powder, coriander powder and mix well. After 3 to 4 mins, add the tamarind pulp and salt. The bitter melons must cook with the tamarind pulp. When it dries out add some more water and cook till soft. This can be served with Rice or Roti/Chapathi. 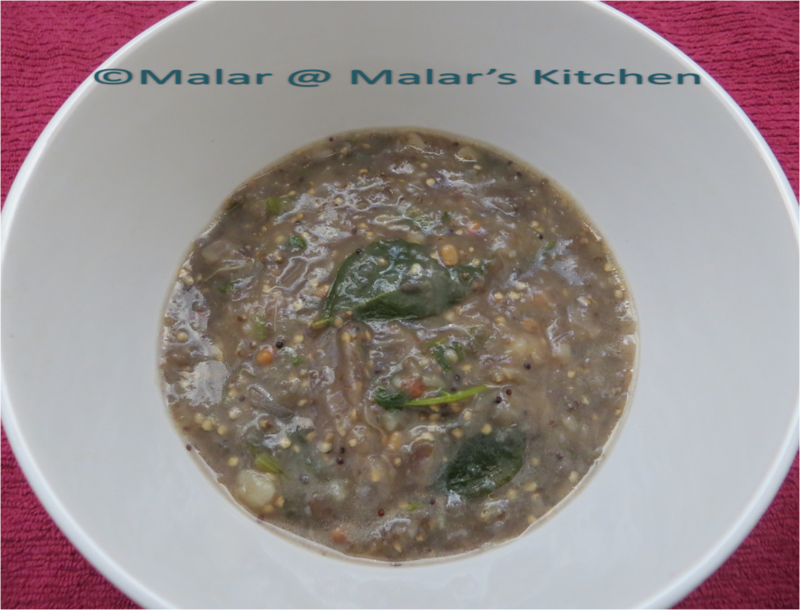 I am back today with a Chettinad gravy called kosamalli which goes well with Idli, Dosa, Idiyappam, sevai. 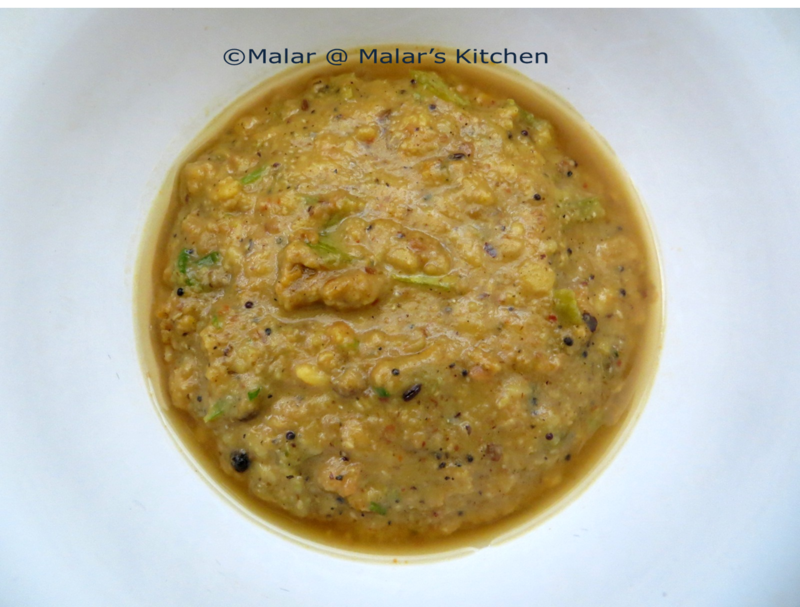 This is a gravy which will make you like eggplant more 🙂 And this is not very spicy like other chettinad food. My grandma prepares it often during weekends. No one can beat her Idli’s softness and with this kosamalli its so yummy 🙂 My friend’s mom used to ask me, how do you chettiar people make such soft idli, what ever I do I am not getting it like you 🙂 I am yet to find that secret 😛 my grandma had already given a lot of suggestions, so nowadays I am getting really soft Idli, but yet if I store it for sometime, it goes a little harder and I have to microwave it 🙂 Still finding out a way to make it soft. 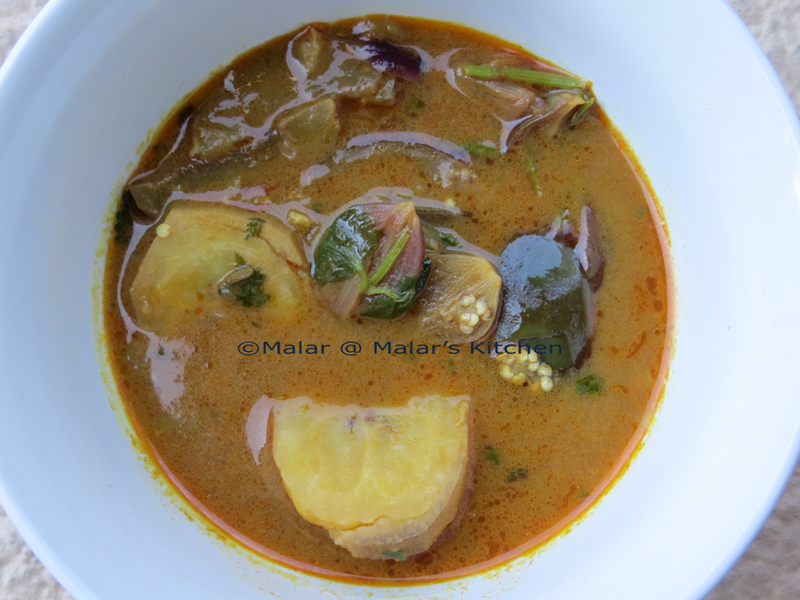 This Kosamalli preparation is quite simple and tastes very good. First chop eggplant and potato. You can either pressure cook or cook directly. I prefer pressure cooking as it is fast. 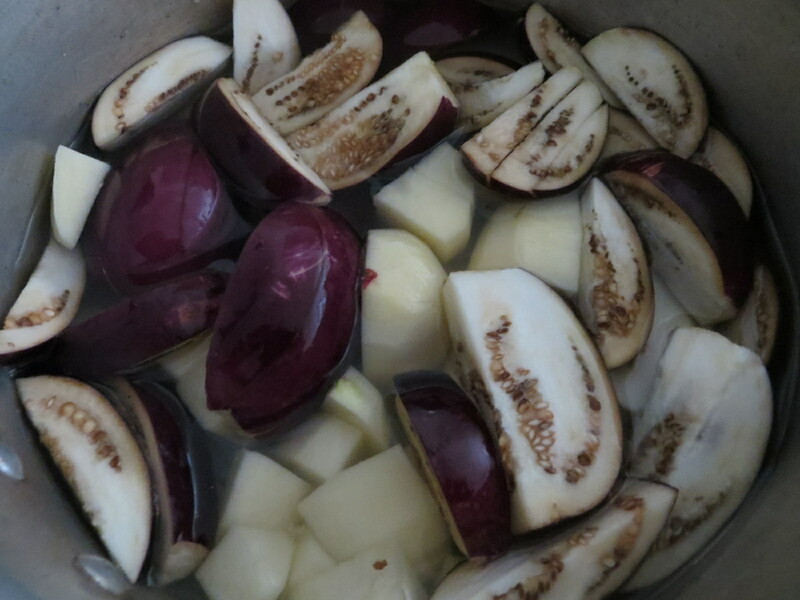 Pour water just to cover the eggplant , potato and cook. I pressure cooked it for 3 whistles. Let it cool down, then mash it well using potato masher. Add salt now and mix well. Next heat oil in a pan, add items in to season, when they crackle, add chopped onions and slit green chili. After 2 mins, add the mashed eggplant and potato. Add some water because that would be thick. Add the tamarind juice. Check for the taste. If needed you can add more salt or tamarind juice. Just heat it for 3 to 4 mins as the vegetables are already cooked. 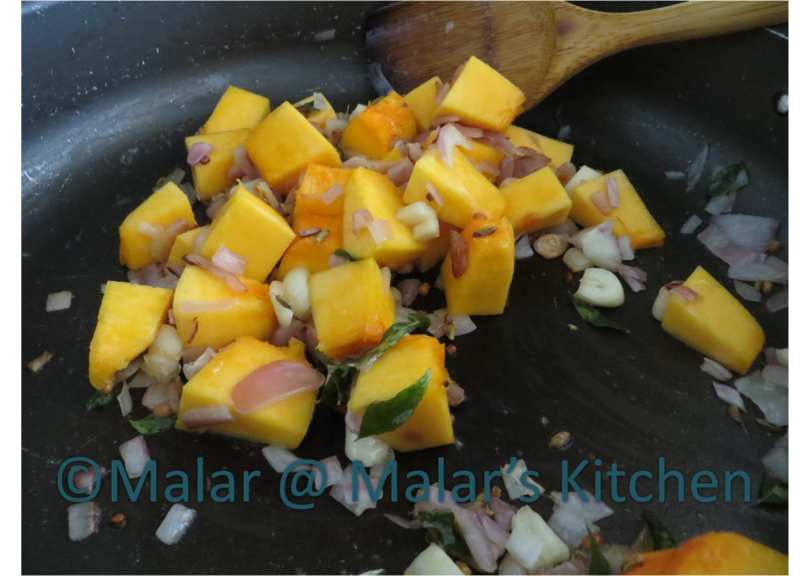 Add cilantro leaves and serve it with Idli/Dosa/Idiyappam. 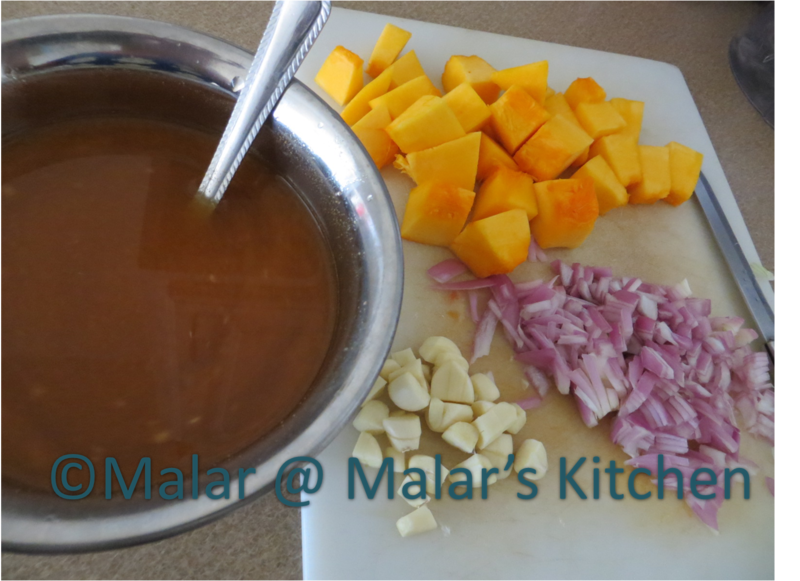 The tamarind juice must be very less, the quantity of juice used must be less than what we use for sambar. Otherwise it would become very tangy and the taste would be spoiled. 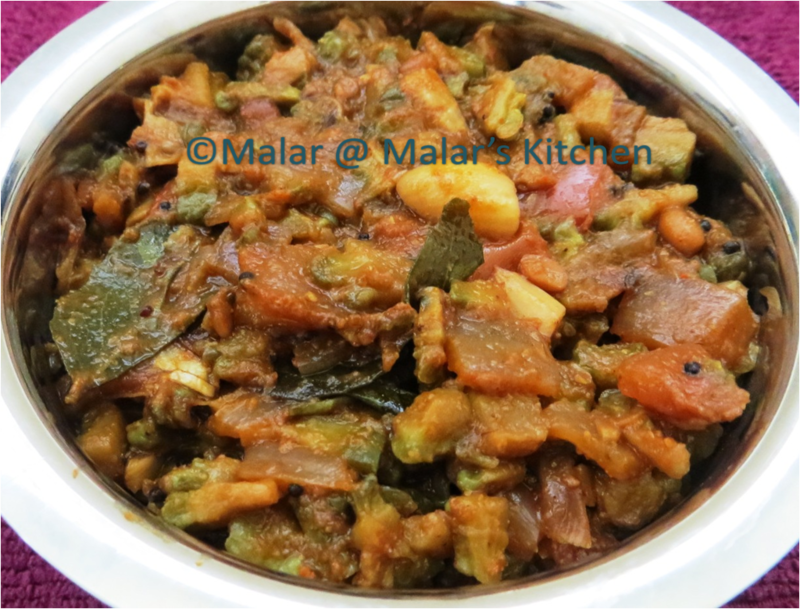 This is a very famous Andhra pickle made of Red Sorrel leaves/Gongura leaves/Pulicha Keerai. This recipe is from my friend’s mom. They are good source of antioxidants. They help in natural cure of kidney stones. They help in treating constipation. This is a pickled version and yeah this requires quite good amount of oil, though not as much as other Indian pickles. I have reduced the Red chili quantity , because Andhra version would be really spicy. 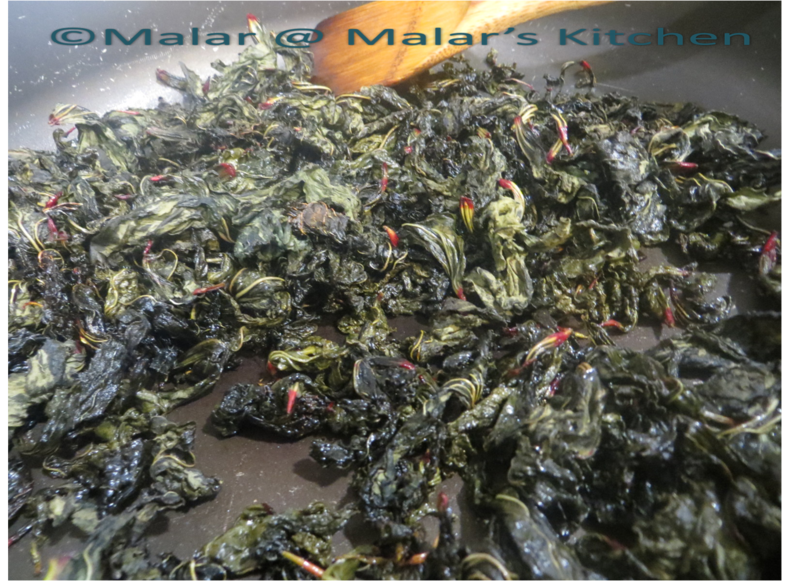 Pluck the sorrel leaves, wash in water and dry them in a cloth for 2 days. NO to direct sun dry. Leave it in the cloth for 1 day. Toss around so that the other sides also gets dried. After 2 days this pickle can be done. Heat 2 tablespoon oil in a large pan. Throw all the dried leaves and mix well. Let it get heated till they turn soft and black. The raw smell would leave of once done. Stop and let it cool. Heat another tablespoon oil in the same pan. 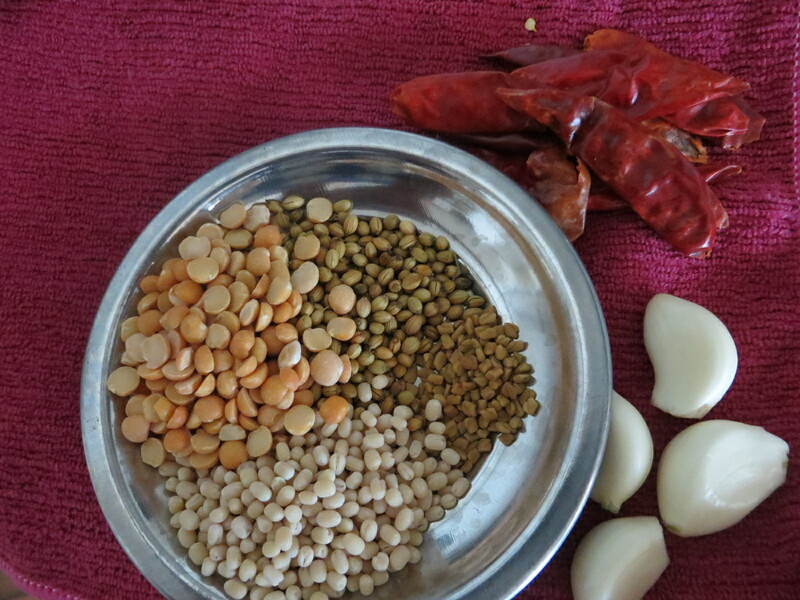 Add channa dal, urad dal, red chili, coriander seeds, fenugreek seeds. They would start color change to slight brown. Now stop and cool down. Once all these are cool. Add all of them with salt in a food processor and grind it to a coarse paste. Add some water if needed. Heat the pan with remaining oil. Add mustard seeds when they crackle add cumin seeds. 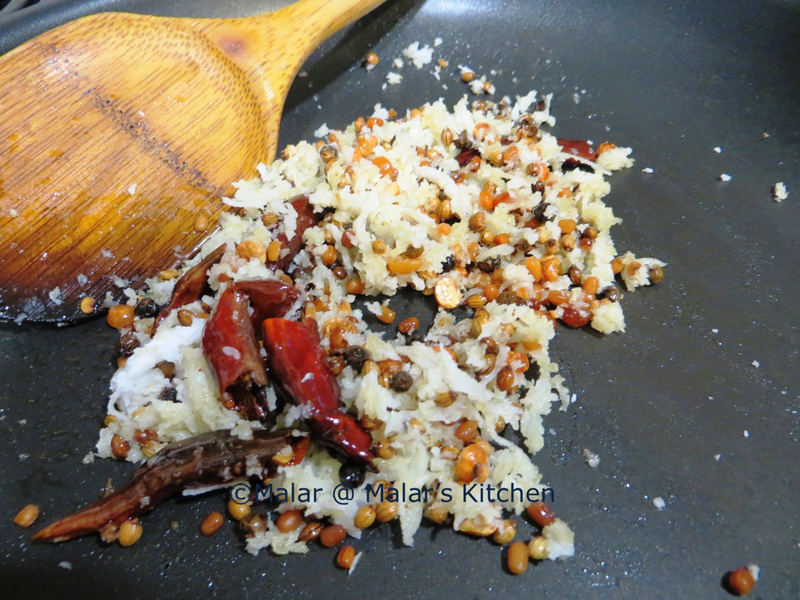 When this also starts crackling add the curry leaves. Once the splutter add the crushed garlic. Once the garlic turns golden brown. Stop. Let it cool. Once it is cool add this oil to the ground paste. 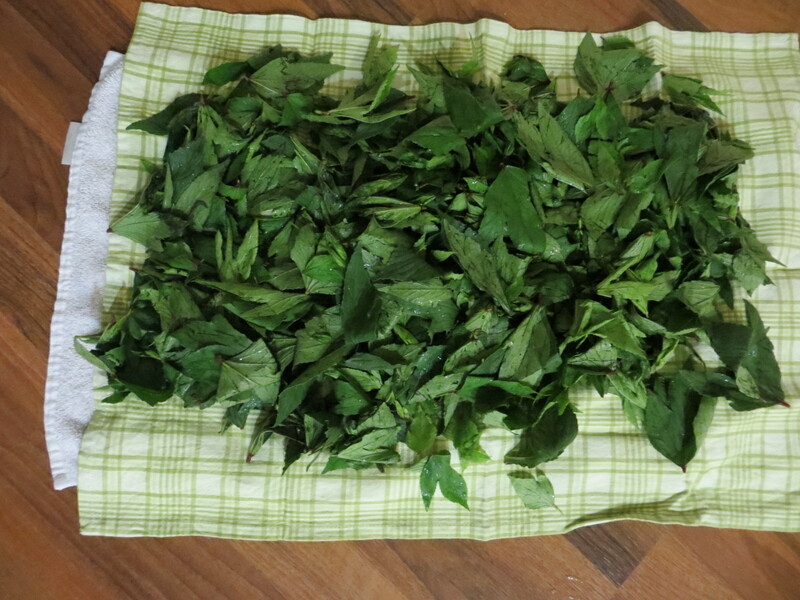 Now the gongura pachadi is ready. You can store for a month. 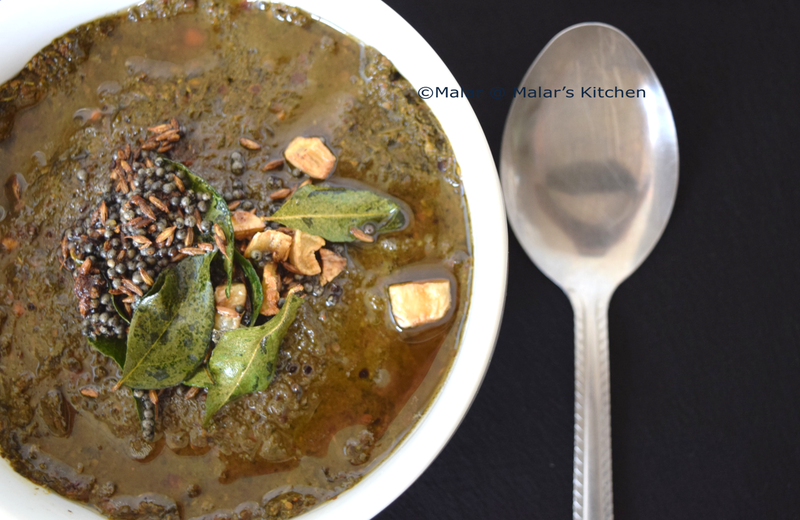 Serve this with hot steamed rice and some ghee or oil, It tastes awesome. Dry roast the chickpea flour in a pan for 3 to 4 mins, until a nice aroma comes up. Cool it down for few mins. Add water to this and make it a nice watery. You can salt to this and taste it, if needed more salt add and adjust. Chop onions, tomato, green chili. 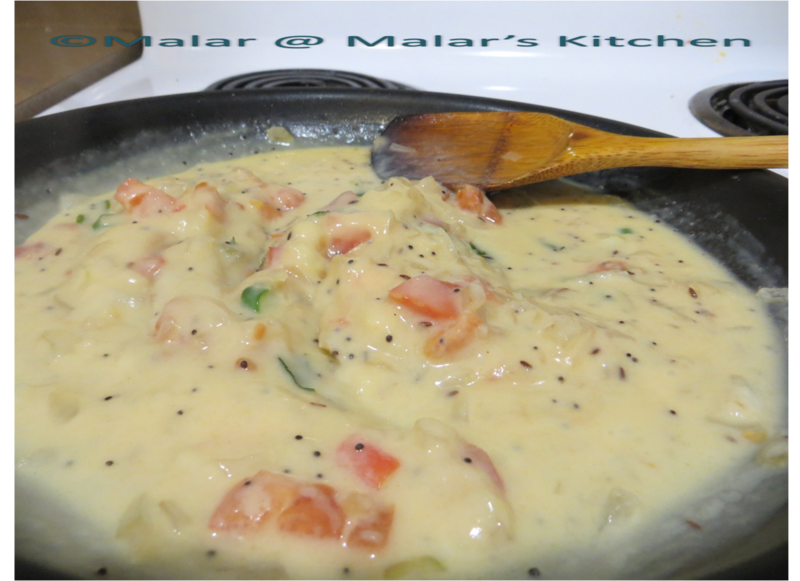 Heat oil in pan, when it is hot add mustard seeds, urad dal. When it crackles add curry leaves. After a minute add onion, tomato, green chili, ginger. Let it turn translucent. Now add the chickpea flour water in this. Keep stirring it would start getting thicker. Leave it to boil for 10 mins. Don’t forget to stir. 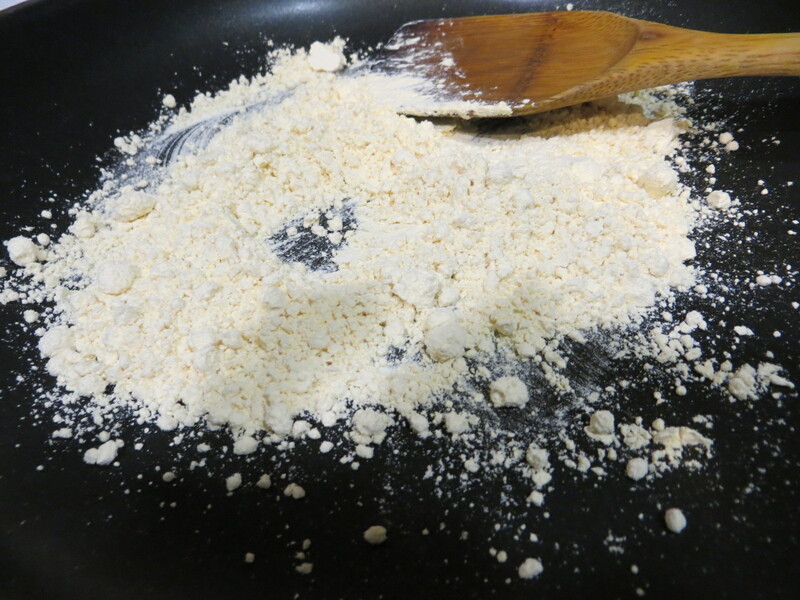 Check if the chickpea flour doesn’t taste raw, if not you can stop. Else boil it for few more minutes. Garnish with Cilantro leaves. As a kid like everyone else I used to hate Bitter melon because of the bitterness. When ever this was in the menu , I wouldn’t eat food and will get blasting hehehe…It changed few years back , once I realized what is healthy, what to eat and what not to eat. From then I started getting these atleast once in a week. 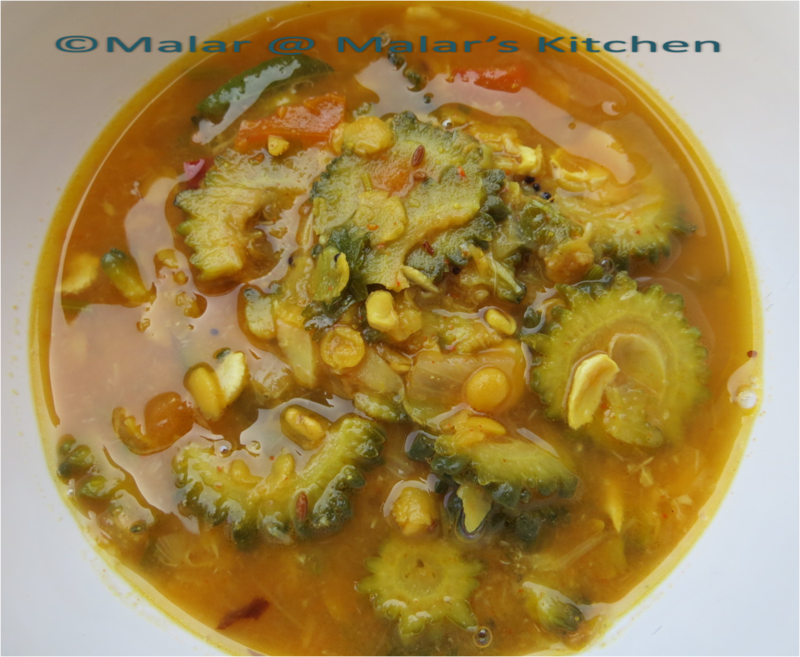 I had influenced few of my friends also 😀 Seeing me bring this bitter melon/ bitter gourd dish ( I prepare it 2 ways, one recipe is here ) every week for my lunch to office , one of my friend prepared it herself and told me that her husband liked it so much. Yay! its great when you can share some healthy prospect to your circle. Bitter melons is one more low calorie vegetable. Its an excellent source of iron and vitamins, minerals. Its a great medicine for those with diabetes, kidney stone, psoriasis, piles(haemorrhoids). Also it is told that, secret of Okinawa Islanders longevity is due to this bitter gourd/melon. 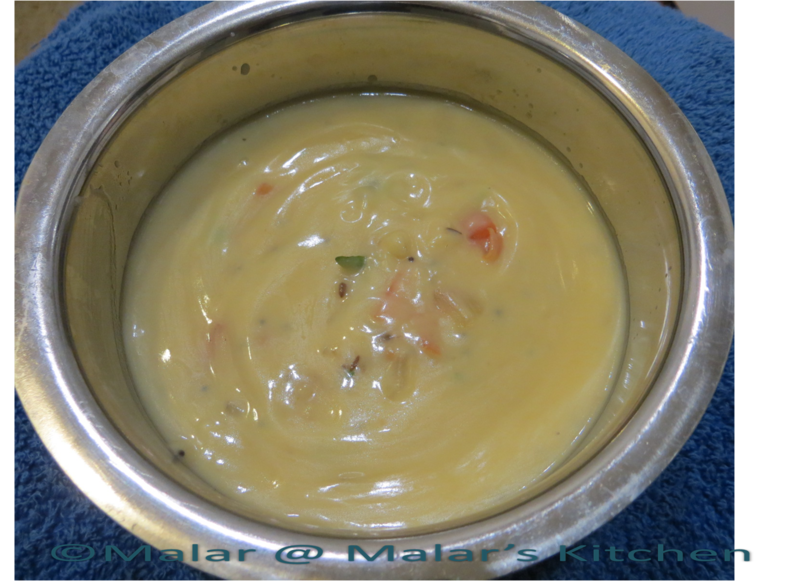 Sambar is not a big deal for any Indian. But I would like to spread this healthy vegetable to everyone around. Lets go with the recipe. Cut the bitter melon to round pieces. 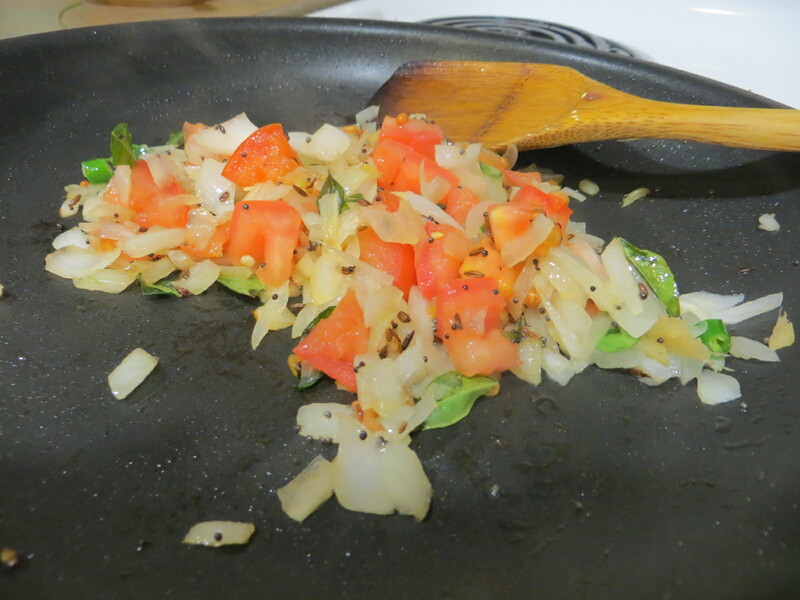 Chop onion and garlic, cut tomato, green chili to pieces. Clean the lentil. Add everything together in a pressure cooker. 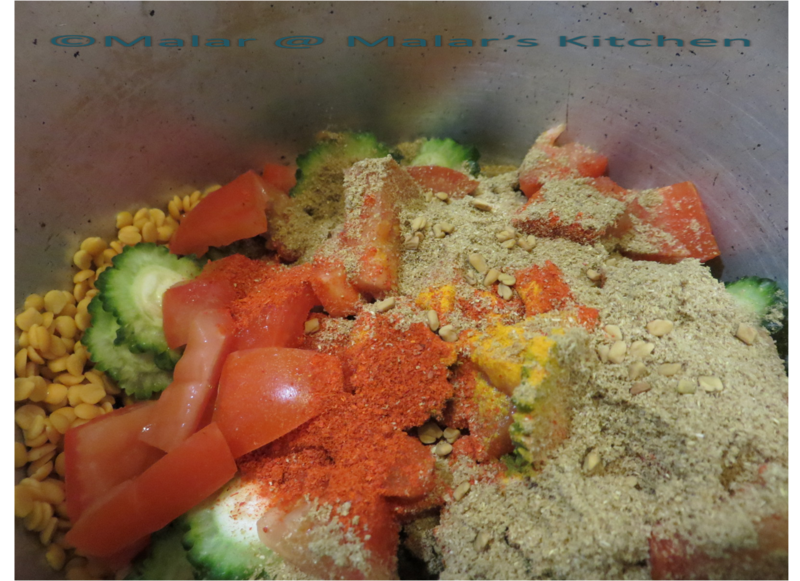 Include red chili powder, corriander powder, turmeric powder, fenugreek seeds. Add 4 cups of water and pressure cook it for 6 whistles or 20 minutes. You can do normal cooking as well without pressure cooker. Just wait until the vegetable is full cooked. Stop and then add salt. Make pulp out of tamarind. In a pan heat oil. When it is hot enough, add items in to garnish. 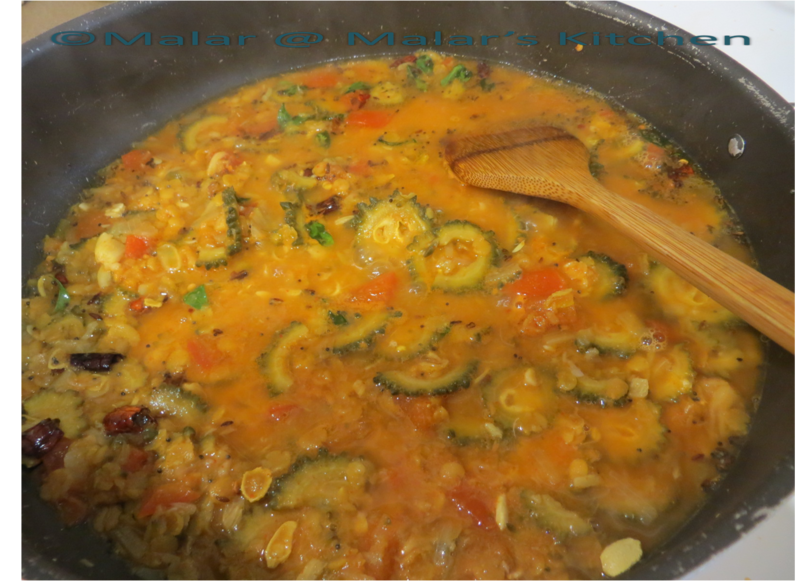 When it crackles, add the cooked lentil and vegetable mix to this. After 3 mins, add the tamarind pulp to this. Leave it for 3 to 4 minutes until the tamarind pulp mixes with the vegetable. Garnish with cilantro leaves. This is again one of favorite dish prepared by my grandma. This time without calling her, I prepared it myself 😀 Yay! I could make it well 🙂 , Quite a simple dish and goes well with cooked rice. 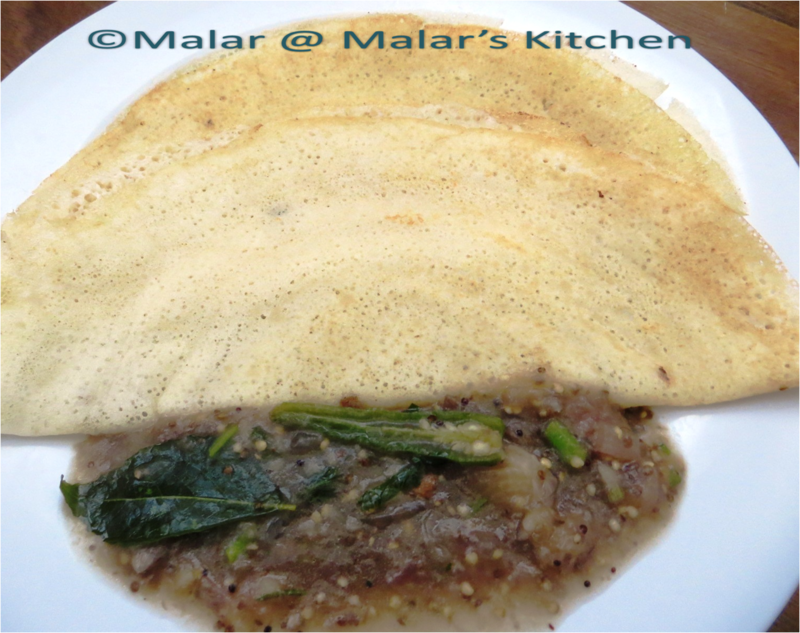 This is another very common dish in chettinad families. The special ingredient in this is the Jagarey/ Gur. It gives a sweet taste and I love that taste with the sour tamarind taste. First Soak the tamarind in water, allow it to soak for 10 mins. Chop the pumpkins to small pieces. Cut the outer hard skin. Chop the shallots/Onions, I prefer shallots for this dish. Chop garlic to small pieces. Grate the Jaggery. After 10 mins, put the tamarind and water mixture in a microwave safe bowl and heat it for 30 sec in microwave. Then remove the extract from tamarind. Pour two cups of water to this. 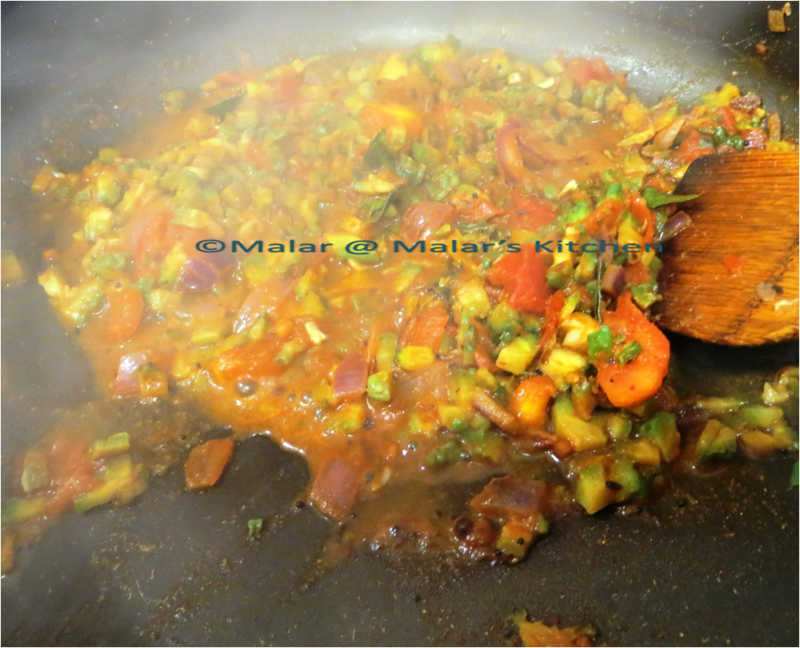 Add red chili, corriander/curry powder , salt, turmeric powder with the tamarind extract and mix well. 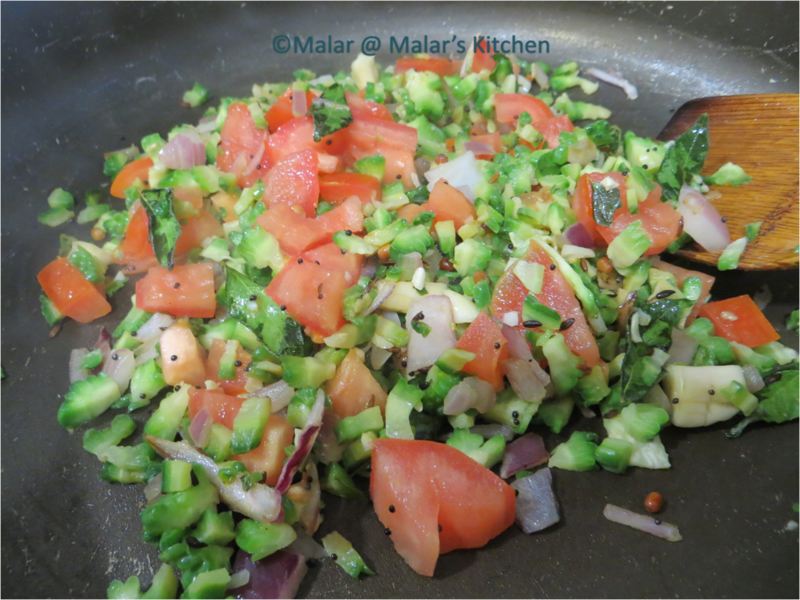 Heat oil in a pan, when it is hot add fenugreek seeds, fennel seeds. Let them crackle. 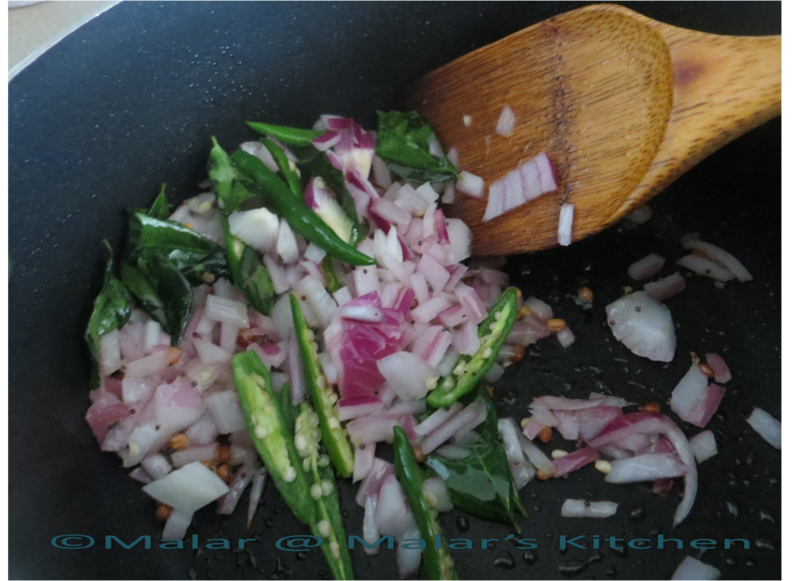 Then add curry leaves, when they splutter, add the chopped onions and garlic. Let it turn translucent. Then add the chopped Yellow pumpkins. Let it get cooked for 3 to 4 mins. When it is 30% done cooking the pumpkins, add the tamarind extract water which is mixed with the powders mentioned above. Close the pan with a lid. Let it cook for at least 20 mins. In between keep stirring. 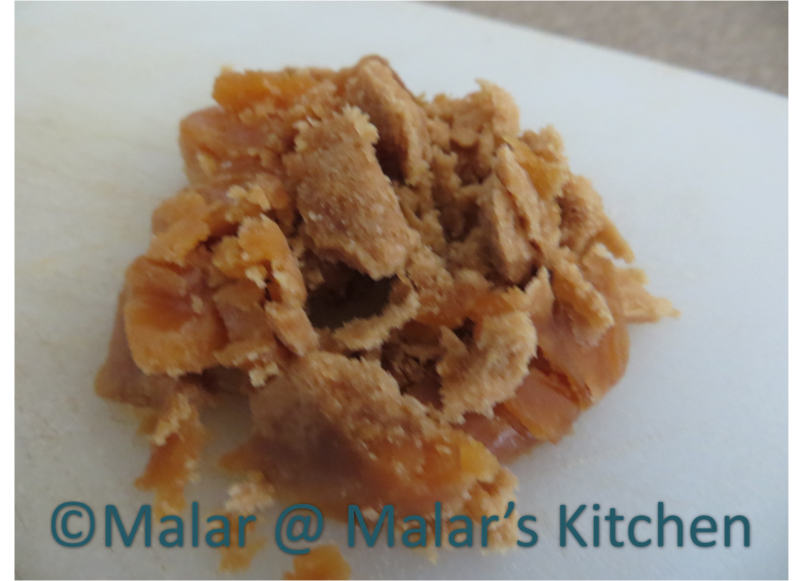 Now add the jaggery/gur in this. Let it cook for another 10 mins.